When I pulled into the parking lot, the sun was just rising over the mountains to the east and only one other car was there at the trailhead. I had successfully avoided all major potholes on the five miles of dirt road driving in the early morning darkness, and was ready for what looked to be a perfect weather day on Colorado’s highest peak. With clear skies and the sun peaking out, I didn’t need my headlamp. The drive to the trailhead took a little longer than expected from where I was staying, so I also got started later than anticipated. 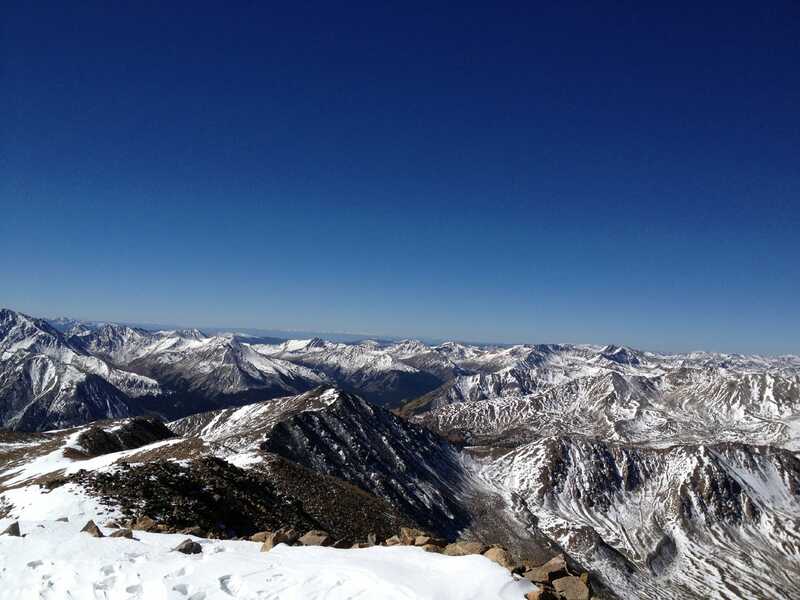 The first few miles up the Northeast Ridge Route were relatively uneventful. The well-maintained trail switches back and forth under tree cover and is easy to follow. The only portion of the trail of note in these first few miles is the junction with the Colorado Trail at about 10,600 ft. I could easily see a sleepwalking solo hiker in the early morning hours take a wrong turn here. But there were no tales of wrongs turns on this summit bid. 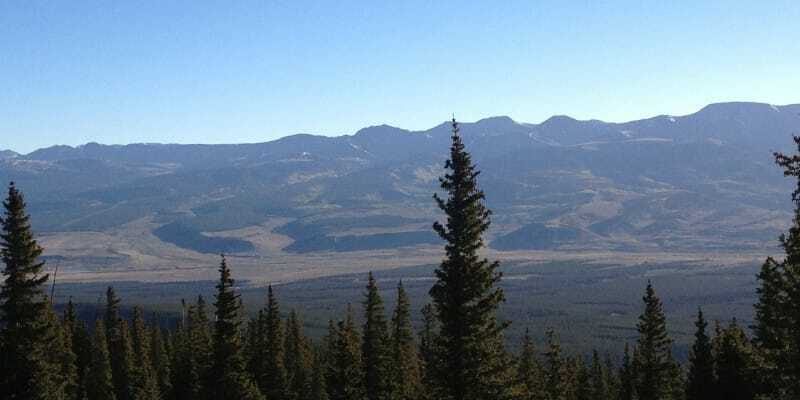 I veered right at the junction with the Colorado Trail and headed up the North Mount Elbert Trail trying to reach tree line. I crossed paths with the owner of the other car in the lot at about 11,000 feet. He was struggling a bit with the altitude and said he was contemplating turning around. My main foe on this summit bid was elevation. Coming from elevations from sea level just the day before, I really started to feel the elevation at about 11,000 ft. 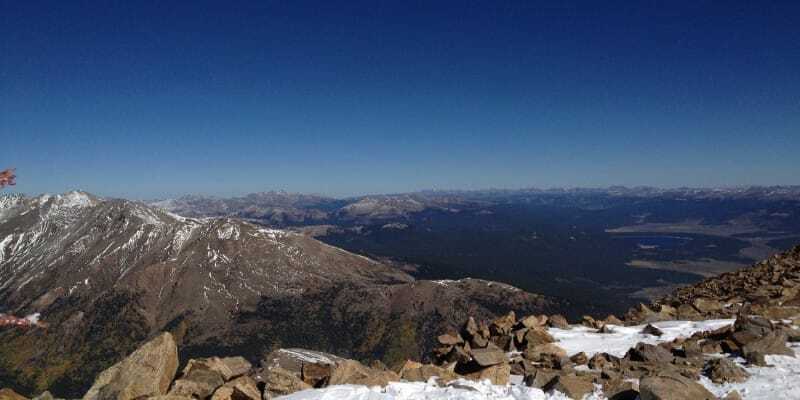 But once I hit the tree line at about 12,000 ft., I also seemed to gain a second wind and ascended the next 1,000 ft. of elevation with little trouble. 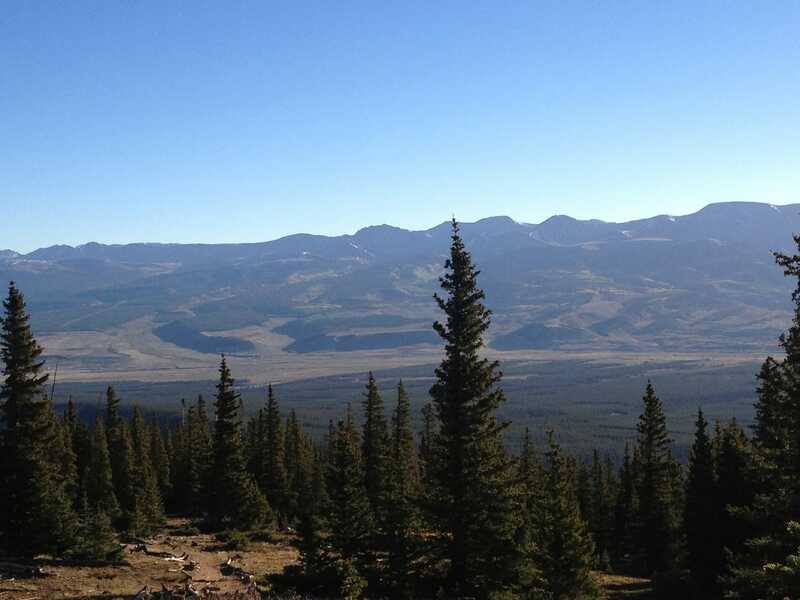 The most challenging part of the climb from both a trail and elevation standpoint turned out to be 13,000 ft. to 14,000. 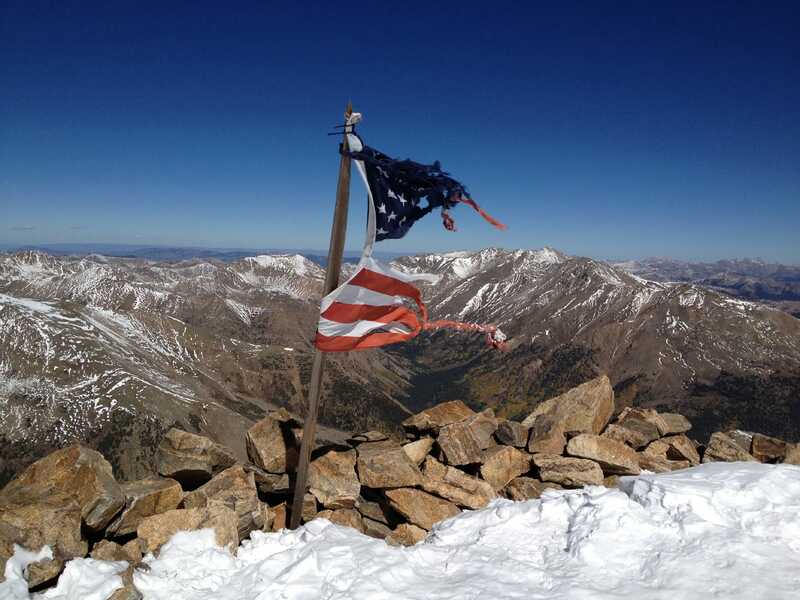 The steep talus/scree section from about 13,400 to 13,900 was partially snow-covered, which added slightly to the effort needed to regain the ridge just under 14,000 ft. But once through this section, the hike to the summit at 14,440 ft. turned out to be the best stretch of all. High winds swept across the trail with blue skies in every direction. A surprising bonus from this day on Elbert was the solitude that I experienced. 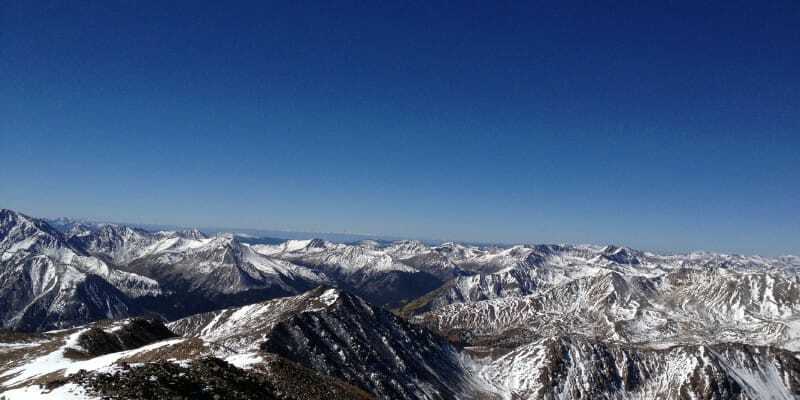 With Mount Elbert being the tallest of all 14ers in Colorado and the fact that the peak really isn’t too far from Denver, I hear that solitude on its trails can be tough to come by. 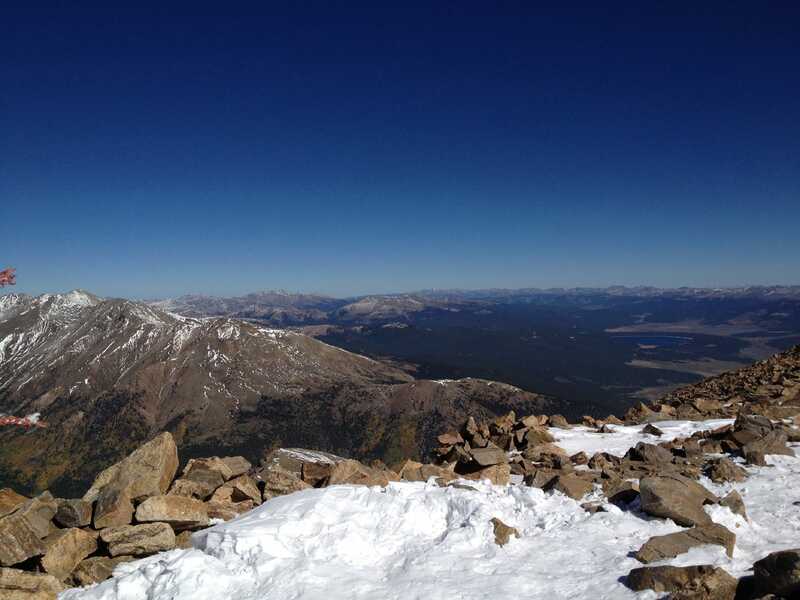 But with the exception of the brief conversation with the guy from Denver at about 11,000 ft., I had Elbert completely to myself all the way until a third of the way down the descent. Even then, I only passed maybe a dozen people total on the descent. I lucked out getting the small window of good weather, too. Only a few hours after I descended, a sizeable storm rolled in and dumped snow on Elbert, Mount Massive and all of Elbert’s other neighbors. Had I waited one more day, I would have had to contend with inches of fresh snow, lower temperatures and possibly much higher winds. Looks like a perfect day. I hope I could be as lucky if and when I make the attempt. Absolute perfection. If only they could all be like this one.